Jennifer Lynn Alvarez grew up with a crazy love for horses, but her family couldn’t afford them. To satisfy her cravings, she read horse books, volunteered at stables, bought horse toys, took lessons, and played “horses” at recess with her friends. She wrote in her childhood diary that one day she would be a published author, and she would own a horse that lived outside our window. In pursuit of her goal, she worked hard at school and earned a scholarship to UC Berkeley, where she studied English literature. She wrote in her college essay that her ambition was to write animal stories for children. After she graduated from college, she proudly purchased her first horse, a failed Thoroughbred racer named Splash. The mare reared every time she rode her, kicked her twice, and trampled her once—of course Jennifer loved her dearly. Meanwhile, Jennifer wrote middle-grade novels about animals, but she was intimidated by the process of getting them published. Time went by, and once her youngest child began school, Jennifer resurrected her publishing dreams. She still wanted to write a book about horses, but she felt like every horse story had already been told. Then in June 2012, she was driving down the freeway and she was struck by an intense visualization. Jennifer saw a herd of flying horses and they were migrating! A white mare, heavily pregnant, was struggling to keep up. A burning curiosity to know more about the pegasi and the special unborn foal overcame her. As soon as she arrived home, Jennifer began Starfire. She wrote the first draft at a lightning pace, revised it, and then sent it to Jacqueline Flynn at Joelle Delbourgo & Associates. Everything happened quickly after that because as it turns out . . . not every horse story has been told! Jennifer is now living her dream. 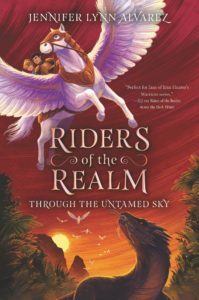 The second book of her new trilogy, RIDERS OF THE REALM, launches on March 26th, 2019 with the publication of THROUGH THE UNTAMED SKY(HarperCollins Children’s Books). 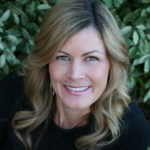 She is also the author of The Guardian Herd Series and The Pet Washer. You can find more information about Jennifer and her projects on her website, on Twitter @JenniferDiaries, and on her Facebook author page.